When I originally posted this recipe, it was during the dog days of summer- not unlike this week’s sticky mess in the Northeast. My parents had lost power from a storm, which also meant that their air conditioner was out of commission. I decided to bring them some pulled pork because it (1) was easy for me to make, and (2) didn’t require much heating up to be good. Dig yours out of that corner or back of the drawer and throw some pork shoulder in it or short ribs or shanks. Whatever suits your mood. I made some beef shank osso buco earlier this week, but since that isn’t a cut that’s so easy (or cheap) for everyone to buy, instead I’ll re-post one of the quickest and most satisfying recipes I’ve got. After all, when it feels like 105 degrees, you don’t want to have to think too much about what’s for dinner. Plus, this is perfect for the weekend! The slaw can be done a day or more in advance. I find the flavors meld more as it sits. Thinly slice the cabbage into a large bowl. Chop the scallions and cilantro. Dice the peppers. Add all three to the cabbage. Sprinkle with the salt and pepper. Toss to combine. Add the mayo (in place of the extra 2 tbsps of mayo, you can add sour cream if you prefer) and the apple cider vinegar. Squeeze in the juice from the limes. Mix thoroughly. Taste. Let sit for awhile and taste again. If the flavor of any ingredient is lacking, add more. If the flavor is too strong, add whatever will counteract it (salt, pepper, spice, lime, mayo). Making slaw is not an exact science, but it can always be adjusted. Give it time to moisten and absorb the flavor portfolio. 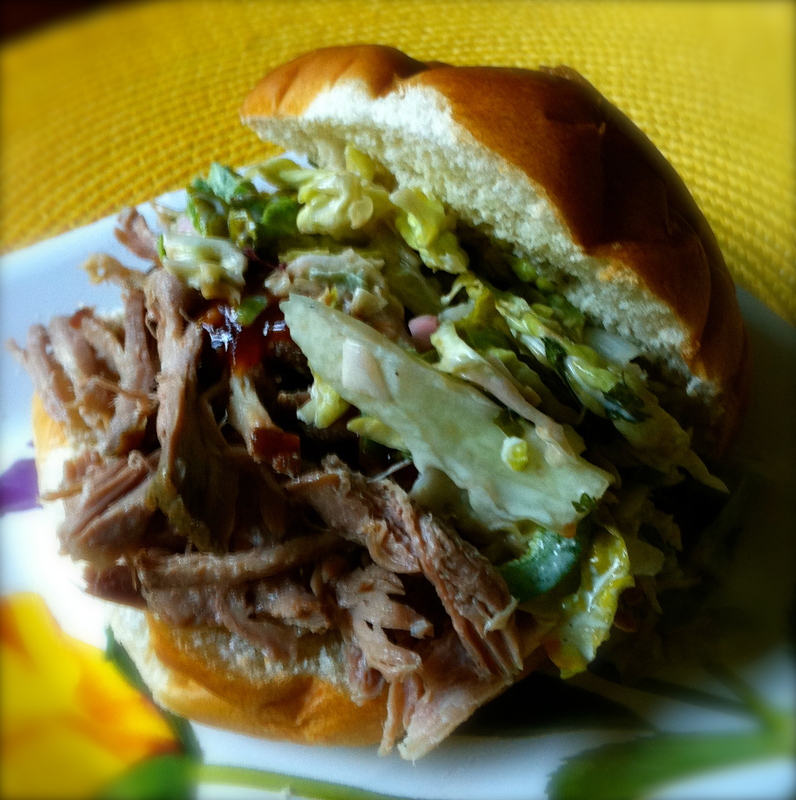 Serve on a soft bun with some BBQ sauce (Sweet Baby Ray’s Vidalia Onion is good) if desired and top with the slaw. You’ll also have enough juice to make a gravy or serve as au jus if you want it wet but don’t want to mask the flavor of the meat. Add the onions to your sandwich too if you want. Note: Even after the pulled pork sat for a full day, it was still incredibly moist and delicious. You can even serve it at room temperature. ← Red, White and Baby Blue! You posted! (was my first reaction haha). Love the flavors and ease of this recipe. Ha! Been much harder lately to come up with new things to write about and have time. Hopefully lots on Africa!